Passionate and creative winemakers of the Adelaide Hills invite you to discover their expertly crafted wares at cellar doors and regional wine events. The Adelaide Hills wine region is arguably Australia's most sophisticated and beautiful cool climate wine region. Nestled among apple and cherry orchards and rolling fields, vineyards are scattered throughout the 70-kilometre length of this varied landscape. Its clean, high altitude environment produces distinctive and elegant wines that can be tasted at approximately 50 cellar doors throughout the spectacular landscape - scroll down for a listing of cellar doors. In addition, many offer tours, food and wine matching experiences, master classes and regional fare, as well as fine contemporary dining. Crush Festival each January celebrates the best regional wine alongside a lively and vibrant mix of dance, music, culture, art, fashion and food at many venues throughout the region. Dates for 2018 are January 26-28. Winter Reds Weekend in July features dozens of cosy food and wine experiences including blazing fires and rustic winter fare. Hahndorf Hill's ChocoVino wine and chocolate matching experience. Sparkling wines and great experiences such as Sinclair Gully's 'Fizzology' session in Norton Summit and Deviation Road's Champagne Master Classes in Longwood - check out this SA Life TV feature 'Fizz in the Hills' on the region's sparkling wine. Other sparkling specialists include Petaluma and Bird in Hand both in Woodside. 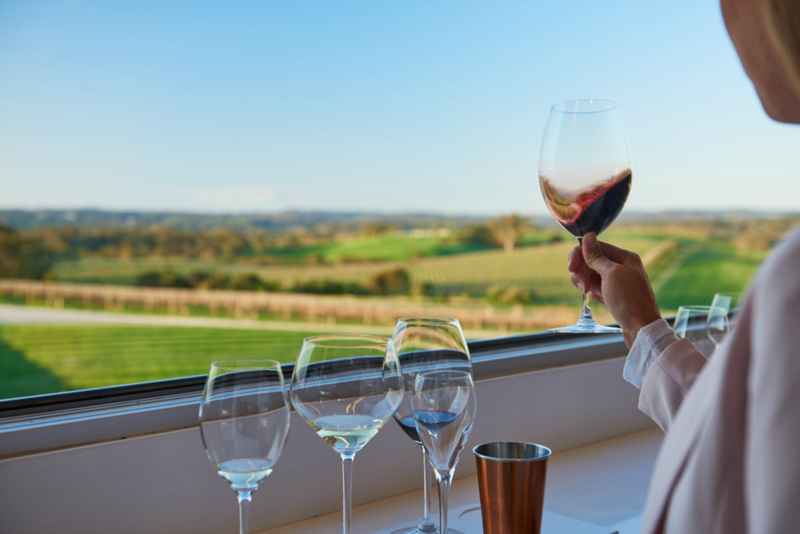 The Epicurean Way food and wine touring route connects the Adelaide Hills with other key South Australian food and wine regions including McLaren Vale and Barossa. If you have the kids in tow, some recommendations for family friendly wineries in the Adelaide Hills include Barristers Block in Woodside, Howard Vineyard in Nairne and Golding Wines in Lobethal where there is plenty of space. If you'd like to taste wines from across the region in one place, try the Regional Cellar Door at Glen Ewin Estate in Houghton, featuring wines from a number of local wineries without their own cellar doors. The Adelaide Hills Wine Centre, part of The Hahndorf Inn in Hahndorf's main street, provides a huge range of local wines available for tastings and to purchase. You'll be able to satisfy your craving for exquisite regional food at the wineries, with many offering gourmet cheese boards, regional produce platters, light meals and tasty wood oven pizzas. If you'd like to linger longer over lunch try The Lane Vineyard at Hahndorf, Maximilian's Restaurant at Verdun (with Sidewood cellar door), Gallery at Bird in Hand at Woodside, or Howard Vineyard's Clover + Stone Restaurant with Asian inspired menu at Nairne. 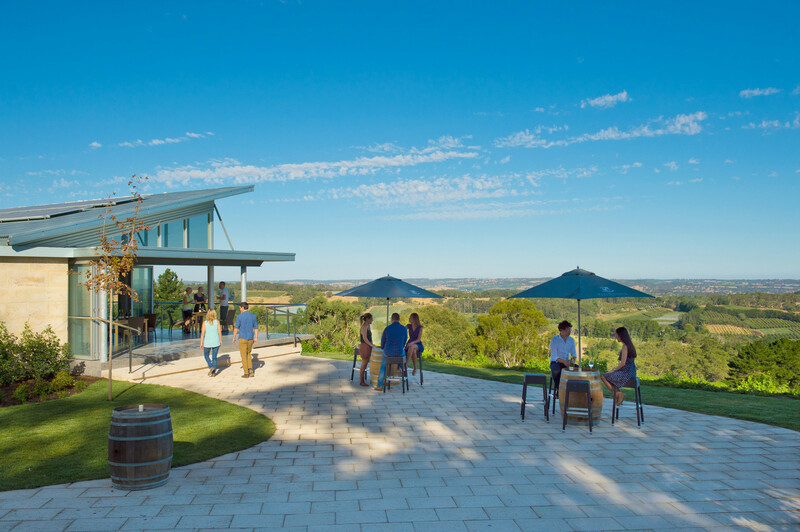 The Adelaide Hills Wine region comprises around 100 youthful wineries run by open-minded progressive wine producers. They are known for their open-hearted willingness to experiment with new methods and varieties. So in addition to the Sauvignon Blanc and sparkling wines for which the region is so renowned, the Adelaide Hills is a leader in 'new wave' Chardonnay, zippy crisp Rieslings, award winning Pinot Gris and lesser known spicy Grüner Veltliner. But it's not all about whites. Stylish, elegant cool climate Adelaide Hills Shiraz is winning awards all over Australia for its modest alcohol, attractive pepper and spice aromas, fine tannins and acid structure. The region also produces a diverse mix of Pinot styles. So whether you enjoy traditional varieties or discovering emerging styles, the Adelaide Hills will have something to tempt your palate - from Arneis to Zinfandel. The Adelaide Hills is about more than wine, it’s a way of thinking. It’s not a recipe or a long line of people doing the same thing, year after year. The Adelaide Hills is about a state of mind, a youthful confidence without fear of judgment. Visit the Adelaide Hills Wine Region website for a comprehensive listing of cellar doors or download their cellar door guide here. Keep our vines and wines safe! South Australia has some of the oldest winegrape vines in the world. Your shoes and clothing can pick up and spread pests and diseases, including phylloxera. Please don't walk amongst our vines. Help protect the vines that make our special wines. For more information about vineyard biosecurity see the Vinehealth website.